The easiest, fastest and safest way of ordering tickets is to make a booking on this website. You can also call our help desk (english speaking staff) on +1 855 325 0977, but you will still make the booking on-line on the web. You can also send your questions via our contact form found on this page, and we will get back to you as soon as possible. Normally you cannot change or cancel tickets to football in Manchester and Liverpool, as we inform you early in the booking process. By completing your booking you agreed to these terms. If you will not be able to use your tickets we will do our best to TRY and help you re-sell them. But it is important to understand that we cannot guarantee anything. If you need to cancel your booking, please send us an e-mail via our contact form with your booking number and we will do our best to help you, either to change it or try to re-sell them. If your tickets are re-sold we need a confirmation from Manchester and Liverpool and after that we need to await a credit note before we can refund you. This process usually takes a long time and it may take up to 1-2 weeks after the match until we know if your tickets were sold or not. We understand that this process is not very suitable for you, but unfortunately this is the procedure we need to follow and we cannot do anything else. Also you must know that IF we do get your tickets resold, the club and our agent will charge a cancellation fee! 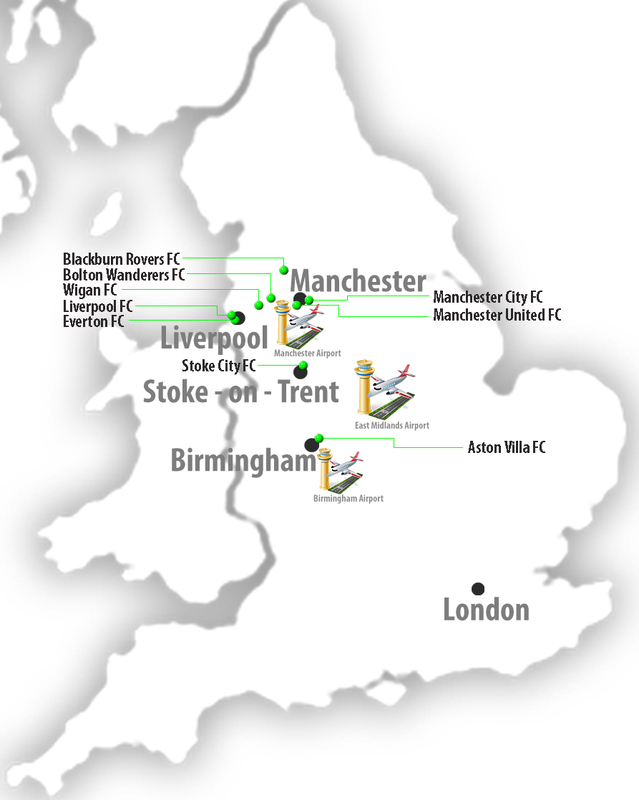 We use multiple agents all are acclaimed football agents for clubs in and around Manchester and Liverpool. We never buy and sell tickets through a non acclaimed agent in the UK. Here you can see a map of Manchester and Liverpool and the clubs we sell in and around Manchester and Liverpool, so you have an idea of ​​the distance between the different cities.CLICK HERE FOR MAP. On the voucher/e-ticket we send to you by e-mail will clearly state our local agents phone number and email so you can always contact them once you arrived in England. The season is over. Tickets for next season will be on sale in June–. Please check the website for details.